New Architects 3 is the definitive survey of the best British Architects to have set up practice in the ten years since 2005. The third book in the Architecture Foundation's highly influential series, it feature close to 100 practices, selected by a jury of leading critics and curators. As a portrait of the emerging talent in one of the worlds most consistently influential architectural cultures, New Architects 3 casts light on the future of architecture in the UK and beyond. The book features more than 450 illustrations of the selected practices' work and is introduced by the Pritzker Architects Prize laureate, Norman Foster. We were extremely pleased that we were able to share some of our work alongside some of Britains other best young architecture practices. We were able to share briefly our Essex Mews and Cecelia Road projects, which you can check out fully on our projects page. In the world of architecture and construction there is a general consensus that many existing residential buildings will have to be substantially renovated within the next few years – not only because they are technically outdated but also because their functionality and esthetics are no lon - ger in line with contemporary demands and requirements. For each venture of this type, the owners and architects must deal and come to terms with the existing structures. Some projects consist of only a few square meters within an old building while others exceed the size of the previ - ously existing living space. Based on more than 100 carefully selected works, the whole scope of possibilities for extensions and conver - sions is presented – from multi-floor annexes, via newly designed existing spaces, to additional sections or merged spaces. 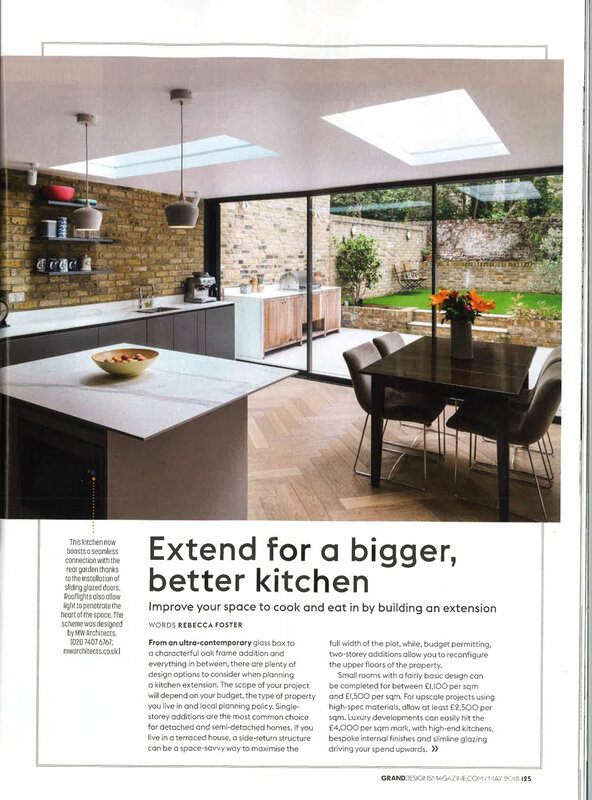 Some of the interventions are understated, while others are preeminent, utilizing matching or contrasting materials, and exhibiting a great variety of different styles – whether minimalist, rustic, elaborate, elegant ..
Our project Warrington Crescent was recently featured in the Evening Standard newspaper! Growing numbers of us work not only from home, but from anywhere; job flexibility has become a key requirement for employers and workers alike. This, in turn, has created new challenges for architects and designers – many of whom themselves start out working from home – who are tackling demand head on with innovative solutions that allow clients to transform their spaces to suit a wide range of needs, from multifunctional studios to homes that seamlessly combine work and family life. Divided into five thematic sections, this book explores the exciting variety of ways that the workplace can be integrated into the domestic environment. From stand-alone multifunctional furniture to mobile room dividers and dynamic solutions that fold out or pop up to create new work areas, each design addresses the unique needs of the space, client and working practices for which it was required, and tackles new questions about the rapidly evolving relationship between work and domestic life in the 21st century. This essential and timely resource for homeworkers and practitioners offers fresh ideas for how to strike the perfect balance between living and working at home. 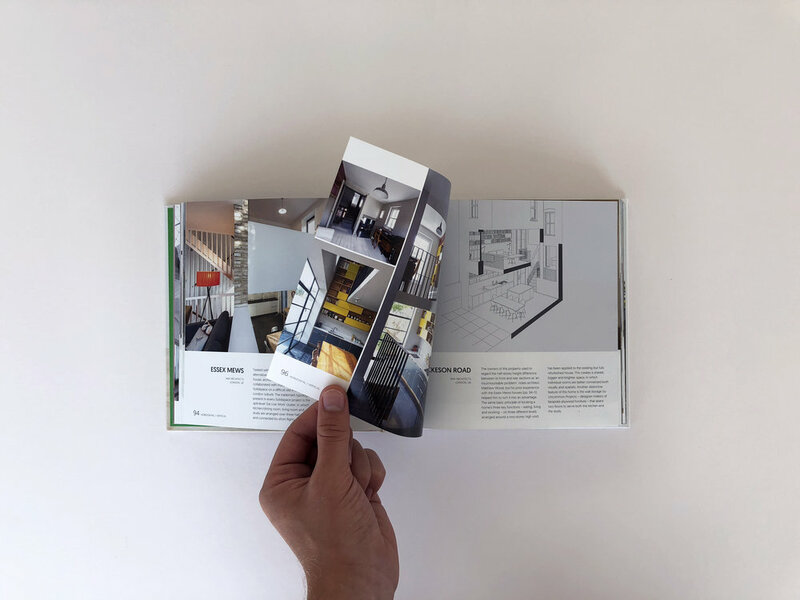 This book gave us the opportunity for us to showcase our split level designs (Mackeson Road and Essex Mews) that connect eating, living and working spaces through the use of dramatic voids.